40, of Austin, Texas; assigned to Headquarters, U.S. Army Special Operations Command, Fort Bragg, N.C.; killed June 17 while conducting combat operations in Qaim, Iraq. Robert was born in Limestone, Maine. To honor MSG Robert M. Horrigan, his mother, Mary Alice Horrigan retrieved this stone from a stone wall near a 90 year-old apple tree in an apple orchard in Belfast, Maine. The apple tree was planted by Mary Alice’s grandparents in 1921, and Mary Alice climbed this same tree as a girl and recently made the best apple pie from its fruit. Watch this video to learn why this stone is significant and what it says about MSG Robert M. Horrigan. Bob was born in January 1965 in Aroostock County. It was 45 degrees below zero the afternoon my twin boys were born. Bob was the second and the smallest of identical twins, weighting in at 5 lbs. 13 ½ ounces. They were typical boys, into everything. What one didn’t think of, the other one did. The problem with having twins was that not only did one get chicken pox but so would the other, and if one of them fell out of an apple tree, it seemed the other would fall down the stairs. Usually within a few hours of each other. If one stepped on a nail in the barn, then the other cut his foot on something else the same day. Might as well bring both in for their tetanus shot, the other one would soon need it. Bob was seven months old when he got his first black eye. He had crawled behind the back door when my husband was opening it, not knowing he was there. My mom came up to babysit and exclaimed, “Oh good, I’ll be able to tell them apart.” When we returned from shopping, his brother John had a black eye too! He had climbed up a piece of furniture and tumbled off. Bob was an average student. He was far more interested in hunting and fishing than school. Both twins were boy scouts. On the evenings they would return from weekend camp outs and they would fall asleep over their supper, their blonde heads almost falling into their plates. When the twins were in high school they would occasionally play “switch” going to each other’s classes. They got to be quite adept at confusing their teaches, and many of their girlfriends too. In his junior year of high school Bob got interested in running. He signed up for a twenty-five mile race and started training. But he got sick and was only able to train for fifteen miles before the time for the race. I didn’t think he should go but he did. No, he didn’t win that race, but he finished it, limping and vomiting the last eight miles. He had given his word. Bob met the love of his life, a girl he’d gone to high school with and they married. It couldn’t have been easy for her. His job took him away for months at a time, and the divorce rate in his line of work is very high. But they stayed together. They were blessed with a baby girl whose birth he almost didn’t get to attend, and to whom he adored. Later Bob joined the Special Forces. His team nicknamed him the pack mule, because he would carry the gear of the others when they became so fatigued they could no longer keep up. Yet Bob wasn’t a big man, 5’ 10”and 175 lbs. After his death, I found in the house a small piece of jewelry. It was a necklace, a small donkey carrying a basket of jewels on his back. I had never seen it before. I wore it for year thinking of Bob and his strength. The Delta Force is the Army’s equivalent to the Navy Seals. It’s very vigorous training. Few made it, he did. Bob had been in Bosnia and Central America. He’d gone to Afghanistan three or four times, Iraq four or five. He has been written about in three books. General Blaber’s The Men the Mission and Me; Sean Naylor’s Not a Good Day to Die; and a novel by Bard Thor, Take Down.” He and Brad were friends. I quote from Sean’s book. “Second in command was another master sergeant, thirty-eight year old Bob H. who functioned as a ‘pack mule’ on patrols, carrying other operators’ gear if they were having trouble keeping up. Bighearted and reliable, Bob’s reputation was of a guy who wouldn’t quit. If you are in a bad situation, there’s nobody you’d rather have beside you, cause he’s gonna be there,” said another Delta NCO. Bob had served twenty years and was retiring from the military in the fall. He had less than a week left in Iraq. He e-mailed me the A.M. he died. He wrote about the house he and his wife hoped to buy, the schooling he hoped to go back to. He wrote about working with his twin brother in metal work and the job he might get. All those plans lost. Bob gave his life for what he believed in. Mrs. Horrigan, my name is Kim Hamlyn. I am a member of The Patriot Riders of America Maine Chapter One, we are having a Spring Ride for the Troops and it will be my honor and privilege to carry your sons memory and stone on this ride. Your son was a true hero and role model. It is with deep sorrow and pride to honor him in such a wonderful way. I want to thank you for the ultimate sacrifice the loss of your son. My son served in Afghanistan and it was the toughest 10 months I have ever spent. I not only carry this stone for your sons memory but for all those who have served and are still serving. My husband Peter and I will be part of the Summit Project and I hope I have the opportunity to meet you and learn more about your son. God bless you and your family. It was an honor to meet you during the hike. I had the honor of carrying your son’s stone to the summit, and placed it at the top along with the other stones. We observed a moment of silence and spoke about each of the soldiers – this was very emotional for me, as over the past few months, I have learned quite a bit about your son – I feel like I really know him. I’ve learned that he was a quiet humble man, that would never stop and never quit, and those are the feelings I had with me at the summit – his perserverance and love of his country. The sacrifice your son made was the ultimate sacrifice, but its important to know that the memory of your son is not forgotten, it will live on with me forever -and so will the moment that I presented the stone to you. It was an emotional touching moment that I will not soon forget. I can never understand what it feels like to lose a son defending our liberty, but I can make sure his sacrifice is worth it. I will have your son in my thoughts every time I live life to the fullest, remembering that I have these opportunities because of sacrifices like this. Thank you for raising an honorable and respectable citizen, who took the oath to defend our country. MLO’s I loved hearing those two stories. He sounds like a great son and an honorable soldier. I wanted to remember Bob (Army Master Sgt. Robert M. Horrigan) because he is an older casualty (would be 50 years old if still alive today) and I am older. He died on June 17 (Father’s Day weekend in 2005) on his last mission in Iraq before his retirement from the Army. The memorial stone that I carried was selected by his Mom from a family orchard in Belfast. 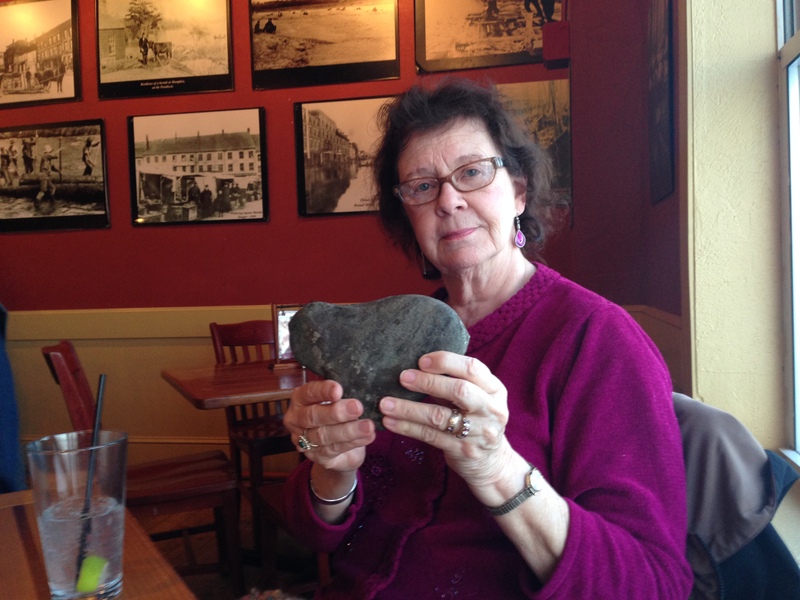 I brought the stone back to Belfast on Sunday as part of 2014 Trek Across Maine. to which I agreed. However, they only made this request after long, uphill climbs (so they could have the downhill with the stone ). American Lung Association staffer, Katie O’Neill, sought me out at Colby College and asked for her photo to be taken with the stone. Katie had written a press release about the Summit Project and Maine Memorial for fallen soldiers, in which Bob’s name was mentioned. She also inserted into the evening program mention of the Summit Project and the names of the three soldiers being remembered. Carrying the stone certainly made me more aware of the sacrifice by young men & women from Maine. Several people that I talked to were vets themselves, were still working in the children with the Maine 133rd. The current circumstances in Iraq make Bob’s loss even more poignant. At the finish line, there was a signature board for all riders to sign their names to celebrate the 30th Anniversary of the Trek. Bob’s name is on the top center of the board. The Summit Project is one of the greatest experiences I have had in my high school career so far. With learning about war and literature in my English class and then being able to learn about our fallen soldiers in Maine, I was able to get the full picture of war in our lives today. We have read and watched many things about war and how it has affected people’s lives, and now that we are able to involve ourselves in this program, it made the unit even more interesting to learn. Reading about Robert Horrigan made realize the prices and tragedies of war. Horrigan served 7 tours in Iraq and Afghanistan. What saddened me the most was that he died a week before was done his last tour. He was a father, a husband, a son, and a twin brother. Being so committed to the army, Horrigan was a very honorable soldier. He joined the army right after high school and continued on until he was forty. He was looked to being such an ordinary guy, but in truth he was so smart, wise, and brave. He was so brave that he was the first one to walk through the door before he was killed in Iraq, June 17, 2005. While I was carrying his rock up the mountain, I was thinking about his commitment and bravery to the army. His rock came from a stone wall near an apple tree that his mother used to play in when she was little. The stone was small yet had so much meaning. I am proud to be a part of the Summit Project. I will gladly join in again another day. I came into the summit project through my high school, Edward Little. As I researched Robert M. Horrigan I was overcome with admiration. He lived his life staying true to himself and to others. He was a natural born leader. The fact that he went from Rangers, to special forces, to delta force at such a young age is awe inspiring. It in fact inspired me to consider joining the Marines. From what his mother posted on the Summit website he was very modest, and that is something that is very hard to come by. As I carried his rock up Bradbury I kept on thinking about the uphill battle he went through, or all soldiers go through in war. I became so overwhelmed that I ran up Bradbury the whole way not stopping except for a few times to let the others catch up. I felt that if he had to give 110% the whole time then so should I. I imagined he had to run a lot so I thought I could connect a little better if I experienced some kind of physical exertion. I give you my condolences on the loss of him, whether he is your brother, father, son, nephew, or grandson. I know what it is like to lose family. I felt honored to be chosen to carry his memory. I wish I could have met him. He seemed to be kind of a mans man and a good friend. He was honest and almost never lied, which is very admirable since it is human nature to lie. I respect that a lot. I am positive that he is in a better place and the he wouldn’t want you all to be sad, but joyful for he has found his peace. I was deeply honored to carry MSG Robert Horrigan’s memory sake up Borestone Mountain in Piscataquis County, Maine. My sisters and I have a family tradition of hiking Borestone on Christmas day. This year we all made the treck with memories of some of Maine’s finest heroes. It was a beautiful winter day. It had been raining for days and the sun broke through the clouds as we started the hike. I couldn’t help but feel Robert’s presence: his courage, connection with the outdoors, quiet strength, leadership, and kindness. It seems that all that knew him loved him. I felt his never-quit leadership as my sneakers filled with cold water and the wind chill temps dipped well into the single digits. And I felt his joyful spirit when I hoisted his stone high into the sun-setting sky. As a mom (of a young daughter), wife, sister and fellow Mainer, I can’t help but mourn his loss on a deeply personal level. What a gift he was to all of us. Thank you for sharing Robert’s story and stone. — and thank you for your sacrifice. My name is Morgan Anderson, and I was honored to carry MSG Robert M. Horrigan’s stone and memory in a New Year’s Day hike of Mt. Monroe in New Hampshire. There were only two of us hiking, myself and Ted Coffin. We both carried the stone of a fallen soldier from Aroostook County. It is typical of a TSP hike to have a circle ceremony at the summit to share stories of what we have learned about the soldier we were honoring. With this small group on New Year’s Day, that circle ceremony seemed to stretch out over the duration of our hike. Ted and I shared stories about MSG Horrigan and SFC Henderson – about the soldiers and about what we connected with in their story. MSG Horrigan would have been my father’s age today, and he came from an area that I hold very near and dear. He volunteered for his final mission, one week from coming home and retiring. He put his life on the line for his country through a twenty year career, and was just as dedicated to his service in his last week as he was on day one. He is a shining example of the humble, quiet, capable, dedicated people of Maine. Ted and I never reached the summit on New Year’s Day. At Lake of the Clouds Hut, the wind conditions and visibility towards the summit kept us from continuing on. We placed the stones of MSG Horrigan and SFC Henderson on the trail sign for a photo and were only able to get one before the temperature shut down our camera. We then began our descent, and just like on the hike up the mountain – we continued to talk about the fallen soldiers who’s stones we carried in our packs. I cannot think of a better way to celebrate the start of 2015 than by celebrating the lives of two of Maine’s finest. I want to thank the Horrigan family for sharing MSG Horrigan’s story with all of us at The Summit Project. Not only am I honored to learn about each of our fallen soldiers, but I feel that MSG Horrigan and all of the soldiers honored by TSP are continuing to make each of us better people. Each soldier I learn about also teaches me something about myself and challenges me to honor their memory each and every day through my own actions. MSG Horrigan and SFC Henderson may no longer be with us, but they continue to have a positive impact on all of us through The Summit Project that has a ripple effect to each of the people we touch in our day to day lives. My name is Renee Fournier. I was honored and privileged to carry your son, Robert’s, stone on our hike up the North Peak of Quaggy Jo Mountain at the Aroostook State Park in Presque Isle last weekend with some dear friends. We made the hike the day after I was able to be a part of the Run for Heroes 5K which honored all the fallen heroes from Aroostook County. Robert was honored and his memory shared at this event as well that weekend. It was a beautiful hike on a foggy morning, perfect for introspection and thought. The entire weekend, as I learned about your son from the person who carried his stone at the 5K and then had the opportunity to learn about him for my own hike, I was continually struck by his humility, honor, dedication, willingness to be the first in, bravery, and perserverance. When he gave his word, it was final. His story has challenged me to be a better person, friend, and neighbor. Thank you for your sacrifice and especially for being willing to share Bob’s memories and story with those of us who have so much to learn from him. It was an honor and a weekend I will never forget. My name is Danielle Lombard, a Veteran of the Army National Guard. I reside in Caribou, Maine with my amazing two children Madison (17) and Dakota (12). I currently work for the Department of Defense in Limestone, Maine, where I have been blessed to proudly serve our men and women for the past 8 years. When I was presented with this unbelievable honor of participating in the 5K Run for Hero’s on May 9th, 2015, I immediately accepted this once in a life time opportunity. I can honestly say that I could have never imagined the overwhelming connection that I felt with Robert once I started inquiring about his amazing life. I am currently the same age as Robert was when he so graciously gave his life for our Country at the young at of 40. Robert left this Earth on June 17th, 2005 on a Father’s Day weekend~ I was born on June 16th, 1974, which was Father’s Day that year. Throughout my life I have been blessed to have a strong Military background, as my Father served for 20 years in the Maine Army National Guard as a recruiter. He actually enlisted my Sister and I into the service. My Sister proudly holds the title of the first female Black Hawk Piolet in the state of Maine, where she has served two tours overseas since 9-11. During my time in service I met my now ex -husband, who ironically was stationed at Fort Bragg and served in the same unit as Robert did, the 7th Special Forces Group. They did not serve in this unit at the same time frame, but just knowing that I had been in the same compound where Robert so proudly served his Country exhilarated me! At that time my heart also reached out to Denise as I know not only what the Honor of being a Special Forces Wife can bring, but also the challenges it holds and for that I commend you! Being able to Honor your Son, Father and Brother has forever changed my life. The pride that I felt while carrying Robert’s stone as other Military Members saluted in his Honor was extremely emotional. Many tears ran down my cheeks that beautiful morning, not in sadness, but in great appreciation for the sacrifice that Robert and the other Fallen Soldiers being honored had given. I may have only carried Robert’s stone for a day, but I will carry his story for a Lifetime! Ever since meeting you and carrying Robert’s stone up and down The Owl on Memorial Day weekend, Robert and you have been on my mind. It doesn’t seem to matter what I’m doing. Whether I’m washing the supper dishes, taking the dogs out before I go to bed, hanging out a load of wash, or teaching a lesson on the Civil Rights Movement, you have been in my thoughts. Yesterday morning I went up to the Penobscot Valley Championship track meet in Old Town. By the time I got there, more than 200 young women and men were getting ready to compete. It was sunny and breezy, one of the first really summery-feeling days we’ve had this spring. The athletes were practicing their block starts, running over hurdles, taking warmup throws in the javelin and discus, practicing their relay baton passes — chattering, laughing, yelling back and forth to each other across the infield. The announcer asked everyone to remove their hats for the national anthem. Everyone fell silent. The only sounds you could hear were the American flag snapping in the wind, and the flag’s rope and chain clanking gently against the pole. I expected to hear a soloist sing. But instead, what broke the silence were the sweet, clear, bright notes of three trumpets; and as they played, an airplane flew overhead. As I watched and listened, I thought about your family and you. I thought about Robert being a distance and cross country runner, and how often he must have stood at attention in a high school track uniform, listening to the national anthem with his eyes fixed on the flag, just like the kids who were standing all around me in this place. I thought about how mischievous you said Robert was and about the pranks he played, how you said “he was into EVERYTHING,” and how in those and so many other ways he must have been just like the kids here in Old Town on this day, waiting for a track meet to start, counting down the days until summer vacation, waiting for two and half months of freedom, maybe complaining about having to go back to school in September, but still looking forward to the hunting and fishing that so many Texas and Maine kids love so much to do. I thought of all the things I’d read that Robert could do — scuba dive, speak Spanish, parachute, make beautiful knives, shoot a sniper rifle true and far. And I thought about Robert’s enlisting in the Army at 19 years old, his decision to become a Ranger. I remembered reading how, during basic training, Robert ran a race that he really wasn’t in shape to run, dehydrated, overheated, simply refusing to quit. I remember seeing in a beautiful film from the Texas Fallen Soldiers’ Project your daughter describe how amazing Robert’s accomplishments were, but because he was so humble she had no idea until after his death how many medals he had been awarded. I heard in that same film Robert’s twin, Jon, saying that when Robert’s country called after September 11th, he answered. I listened to you describe the pain you have lived with since Robert’s death in Iraq; and I heard Jon say that his brother “laid down his life for everyone here.” I thought about the stone you found for Robert under the apple tree in Belfast. I thought about meeting you for the first time on the green in front of the Twin Pines lodge, and then of coming down off of the Owl to return Robert’s stone to you in the late afternoon sun last Sunday. I thought about having dinner with you Sunday evening, listening to stories about your life in Texas, your move back to Maine, your learning of Robert’s death, and your life since. The last few notes from the trumpets hung in the air — then, briefly, it was quiet. I thought during that breath of quiet how much of a debt we all owe to your son for all that he sacrificed. I thought of the freedom represented in the hundreds of athletes competing joyously and fearlessly in a high school track championship, and in the peace of mind, the liberty represented in a plane full of passengers heading unafraid toward a far-off destination. I thought of the debt I owe to you for allowing me to learn about your son, the privilege of carrying Robert’s stone up and down a Maine mountain, the privilege of telling others about what a brave, funny, loving, humble, strong, and truly extraordinary human being Robert Mark Horrigan was, and the privilege of meeting you. Thank you for making the time to talk with me, Mary Alice. Thank you for so graciously sharing your memories. It was a blessing to have had dinner with you, to talk about pie crust, parenting, faith, flowers, baking bread, and “the hill people and the lake people” in Dedham. I will be so happy to see you again, to share recipes, and to get to know you better. And I promise to make sure that your son’s memory lives and flourishes through my teaching, and through my work with The Summit Project. Recently it was my honor and privilege to carry Roberts stone thru the town of Lincoln during the summit project. It was an emotional day for all involved. Many of those in attendance like myself were military men and women doing our small part to honor maines hero’s in our own little way. The more I researched Roberts life and career in preparation for the March the more connections I found to this amazing man. We both came from families with long roots in military service both enjoyed the physical fitness sides of our lives and both have a passion for bladesmithing. One more reminder of the brotherhood that we all share. Three days after the summit March I completed my final day in the army setting aside the fifteen year commitment that began when I was only 18. I can think of no better way to end this chapter of my life than honoring a true warrior, a great man, and hero that came before. It has been an honor and a privilege to have share these days ensureing Roberts sacrifice and his lfe will NEVER be forgotten. SSG. Gerald Myrick. US ARMY. My morning started around 4am as I checked my pack, filled my water reserves for the hike, and re-read my write-up about MSG Robert Horrigan aloud in the kitchen. My cat Zoe, sometimes called “Monkey” or “Monster” or monster depending on my mood; sat attentively on the kitchen table as my audience for this morning’s practice speech. It was a day full of anticipation as I headed out to join the other hikers at the University of Maine for the day’s plan to honor those that have given and sacrificed for our country. Before we started out on the hike we had a small ceremony at Maine Veteran’s Home where the stones were presented to the hikers by some of the Veteran’s receiving care there. The morning’s ceremony was flawless as the Marine Corps League honored the Summit Project in a column with their salutes snapping with precision and intent. I spent the majority of the hike beside or behind a Marine, Kyla Harrison. She was carrying the stone of PFC Buddy McLain from the US Army. We spent time sharing stories about the individuals that we were honoring today. As I talked more and more about Bob that morning I was aware that I was consciously working to ensure that I would be able to speak about him in the ceremony without reading from any written notes. Somewhere along the hike just before we got into Orono a fellow hiker needed to make some adjustments to their pack and I asked them if I could carry their pack for them briefly while they made the needed adjustments for themselves. It helped me connect very briefly to Bob as I thought of the nickname from his team “the pack mule” because he was always willing to carry more when others needed the help. Crossing the bridge in Orono felt almost ceremonial as people were enjoying the beautiful weather, the sunshine, and cool breeze coming across the bridge felt like I was walking home with an old friend. Walking onto the campus there were college kids playing rugby on a field to our right, and students were walking around and sitting on the campus mall together. People’s lives were unfolding all around us with the enrichment that comes from engaging higher education and connecting with others; all possible in no small part to Bob’s sacrifice and the sacrifices of those before him from 1776 – present. The ceremony was a blur…it seems like only minutes passed as I found myself in front of the podium sharing Bob’s story, joining the Army with his twin brother, his time in the 3rd Ranger Battalion and later after selection and his time with the 7th Special Forces Group (Airborne) and evolution into Delta. A firm handshake from Major David Cote and I was back in line with a patch to remember this experience with that will find its way onto a pack of mine that I’ve deployed & hiked with countless times. It was an honor to be a part of this, unforgettable experience. Saturday morning, October 17th, 2AM…wide awake. My name is Alain Ouellette and my family and I make our home in Fort Kent. The Summit Project is a new chapter in my life; it has afforded me the chance to connect with a part of this great country’s history in a unique and personal way. I was given a great privilege…it was an opportunity to join new-found friends in an unforgettable experience, the opportunity to carry the memorial stone of Master Sergeant Robert H. Horrigan, a native of Limestone, Aroostook County, Maine…a region of this great state that some of us proudly call home. Early that morning, one of my new “Blackwoods” Team members and I made our way to the assembly point. There was much activity but it all seemed so well orchestrated, so organized in every detail; this was no ordinary social gathering. As we received our designated stones, the gathering took on a more somber tone; the gravity and responsibility for what we were to embark upon became front and center. In spite of the occasional squall marking our departure, it seemed that the closer we reached the summit, the more the clouds parted and the sky became ever clearer. While the climb was not a difficult one for the most part, whenever a member of the Team seemed unable to continue, another was there to help. It was during those very moments when my thoughts went to Robert, the man they called “the Pack Mule”…the one who always stepped up to meet any challenge, one who regardless of the circumstance, would help a comrade by “willingly lightening the load of those around him with his quick wit, disarming charm, and trademarked sense of humor”. You see, Robert’s Mom, Mary Alice described Robert in that way to me. She reminded me that “Robert was not a quitter” and that his only desire was to serve his country with all the courage and integrity a soldier of his caliber requires to accomplish all that he did in his brief life. As we assembled at the summit of Cadillac, our opportunity to share our experience with one another took on a perspective that I was not able to understand initially. You see, all the preparation, all my attempts at memorization of Robert’s incredible achievements both on and off the field of war left me. I was a blank slate, nothing could I recall from all my research, it simply left me. All I had was a brief but poignant story Robert’s Mom shared about the story of a small bejeweled donkey on a chain that she had found amongst Robert’s things following his untimely death and how it helped her cope with her indescribable loss. It reminded her of her son, the “Pack Mule”…that is all I could remember, all I could share…or so I thought. I end with a promise to Robert’s wife Denise, his daughter Courtney, his sister Lisa Shine, his twin brother John, his brother Daniel, and to you, Mary, that my wife, Louise and I will forever keep Master Sergeant Robert Horrigan and his family in our daily prayers. On Sunday 11/08/15 I had the honor of carrying Robert’s stone in a 4 mile Veteran’s Remembrance Race. Following the race our group carried 10 stone up Blue Hill Mountain in Blue Hill. My name is Dotty Small and I am a police officer for the City of Ellsworth Maine. I never expected to feel the emotions that I felt when I saw Robert’s stone. Being given the opportunity to honor Robert by carrying his stone is something that I will never forget and will always be grateful for. While Robert and I ran along the Shore Road in Ellsworth in the beautiful fall sunlight we passed several apple trees that made me think of him as a boy playing in the orchard. I thought about all of the difficult training that he endured and the hardships he must have faced being away from his family and his friends. As I gulped water at the 2 mile mark I thought about the miles and miles that he ran even though he was dehydrated, vomiting, and probably in more pain that anyone ever knew, because he said he gave his word that he would finish that race. I work with three men who are half of a set of twins and I thought of the special bond that he must have had with his brother. We held a moment of silence on the summit of Blue Hill Mountain and reflected on our experiences. The sun was shining, the wind died down, it was quiet and you could see for miles. Thank you for sharing Robert’s story and his stone with me and please know that he will never be forgotten. I will carry a prayer in my heart for you all for the rest of my life. Our visit to Arlington National Cemetery on Wreaths Across America Day was to honor your loved one who made the ultimate sacrifice, to respectfully support you as a Gold Star Family through a difficult time of year, and to form a bond between you both through your chosen Summit Project stone. Your son’s passion and commitment to protect this Country will live on through his marble marker in Arlington, his Summit Project stone in the State of Maine, and with his life’s story to those we both meet in the future. Your son, our Hero, Will Never Be Forgotten. My name is Everett M. “Doc” Cheney . I served in Alpha Company 1st Platoon 3/75 Ranger Battalion. My first morning reporting to 1st Platoon as their “new Doc” Robert was in 1st plt. and he could see that I was going to need help . He stepped up and introduced himself to me and helped me find my squad leader, my bunk and showed me how to square away me gear as per Alpha Co. standards. As time went on he was always there whenever it seemed I was just about to get overwhelmed either by being one Doc with too many patients or he would find me struggling to get a young Ranger back on his feet after he had collapsed from dehydration, fatigue and lack of sleep. Robert was interested in what skills I had and would jump right in to learn and assist in what ever I was facing. He was without a doubt , THE reason I made it through that first year and was a true friend and brother to me. He , it seemed was always there with a laugh or a joke when it was sorely needed, his strength of body , mind and spirit was a thing to behold , I have never known another person in my life like my Ranger brother Bob Horrigan and i now know , I never will. wether it was helping carry my extra load of medical gear or helping me move an injured or sick Ranger , many times carrying his combat load and ruck on his back with the injured Rangers ruck LCE and weapon across his (Roberts) own chest while assisting the Ranger on his feet and talking with me all the while as if it wasn’t heavy or a burden at all. Ive went on in my life with Bobs lessons and leadership in my mind and a permanent part of who I am as a leader (Battalion Chief on Fire Dept. ), as a man. God Bless you and your entire family Robert’s family , Roberts brother (& Ranger brother) John . there are truly hundreds of Special Operations warriors, civilians and other persons from several nations that owe a life long debt to Robert , myself included. And to all of them and all of that , he would just smile and say ,”you don’t owe me anything”. OMG. Thank you so much. What a lovely tribute. I shall try to send it to all in my family. You have truly made an old woman’s day. It means my son is not forgotten, and that is so important to me. Did I miss something? When did you write this? Hello my name is Riley Kelley and I am 12 years old. I had the pleasure of carrying your son Army Master SGT Robert M. Horrigan’s stone on a 4 mile walk from South Portland, Maine Boys & Girls Club and back. I have never experienced anything like this before. After reading about him I was happy to get to know him. He was a hero to all of us. My picture was in our paper along with my friends letting people know about the Summit Project. Thank you Riley. For carrying the stone and for letting me know about it. It is people like my son and people like you who make this country great. My name is John and I am part of the Nokomis JROTC and we climbed big moose mountain and i choose your sons stone to carrie up the mountain. I choose his stone because I thought it was a very brave thing he did by volunteering for that night raid. I never really done anything like this before and I am always going to remember this brave and courageous man. Big moose mountain was a hard climb and it was challenging but I kept thinking about how many challenges your son had to over come in the army. I loved reading about such a great man and his story, I liked how you choose the rock from the rock wall next to the apple tree and I thought that was a great place to get the rock. I really don’t think i’m ever going to forget this experience and i am never going to forget carrying the stone of such a great american. It was an honor to carry his stone. “Mom, some wars are worth fighting…” On the inside fly leaf of Sean Taylor’s book, “Not A Good Day to Die” these very words were inscribed in Army Master Sergeant Robert Horrigan’s own handwriting. It was those very words that instilled in me the significance and gravity of what I was to encounter this past Memorial Day weekend. My name is Alain Ouellette and my wife Louise and I proudly make our home in Fort Kent, Maine. It is no accident that I asked, and was granted the honor of carrying Robert’s memorial stone…you see Robert and his twin brother John are also natives of “The County”. Who better than another County boy to pay his just respects in such a manner. Preparation for such an event requires both mental and physical training and research, and I could not accept those challenges lightly. Not because I was likely to be the “elder hiker” and possibly hold back my fellow TSP brethren, it was because it was my duty to prepare myself for this one occasion to serve as Robert’s own “pack mule”. It was only befitting for me to pay my respects for this County hero by ascending our mountain with the same level of determination that Robert would have expected of himself, and of me. We were all told the climb was going to be a challenge however we all took courage in knowing that the cause was well worth the effort, in fact our efforts paled in comparison to the sacrifice our hero faced. This was also a most special occasion for me in that I also carried with me a small memorial of “the pack mule” which I hope to soon give to Master Sgt. Robert Horrigan’s family. As President John Kennedy once said, “Let every nation know, whether it wishes us well or ill, that we shall pay any price, bear any burden, meet any hardship, support any friend, oppose any foe to assure the survival and the success of liberty.” MHANF…ever. “I am so sorry for your loss. I think that Robert was a very interesting person. He seemed very funny and sweet. I can’t believe he played twin switch in high school to fool his teachers!! I hp[e his loved ones cherish the memories they have of him, I know I will. Two other campers would like to share their experience carrying Robert’s stone with Arianna. “The hike to Table Rock with his stone was an amazing experience. We’ve learned a lot about him. Carrying his stone up the mountain was a very difficult task but we didn’t give up. His story inspired us to get to the top. When we got tired, and the stone seemed to get heavy, we remembered how inspiring his story was. It gave us the strength to keep going. His story was really inspiring… we will never forget him. “I got to carry Robert’s stone today. He was part of Delta and an identical twin. How much the rock weighed showed me how much he was loved and how amazing he was. I felt honored to carry him and would gladly do it again. I am putting my heart out to the family and their pain. I will always look up to him as a friend. Thank you for letting me have the honor of carrying him and I want to say to him and his family, thank you for serving. I’ve had the privilege for the third time to carry yet another story and memorial stone to honor and remember one of our very own Maine Fallen Heroes. The first story & stone I carried was that of my oldest son Spc. Dustin J Harris on Team Blackwood, the second time I carried the story & stone of Capt. Jay Brainard on Team Tarm and this year I carried the story & stone of MSGT. Robert Horrigan on Team Kebo. As a Gold Star Mother myself I am humbled, honored and amazed each time I participate with the Summit Project. With Grace I try to carry on where my son left off with his mission to Honor not only our Country but our Veterans however I can. Our Memorial Stones for our fallen each have a family member as I, who have endured tremendous tragedy, loss, daily struggles and such sacrifice. The remarkable indivials that I’ve meet and connected with truly enlighten my life and comfort & soothe my heart. Together we gather each year to teach, honor & remember all the while embracing others that truly understand our pain. On June 17, 2005 as MSGT. Robert Horrigan entered a well known suspected Al-Qaida Compound in Iraq. He was hit by fire from the enemy, killing him instantly. This was his 8th deployment overseas and when this deployment was up he was looking forward to retiring and enjoying his time with his wife, daugther and family. Robert joined the US Army in 1984 as a Ranger and thoughout his military career become an Elite member of Delta Force. Some of “Bobs” military decorations included: Bronze Star Medal with Valor Device and oak leaf cluster, Ranger Tab, Special Forces Tab, Legion of Merit Badge, just to name a few. Posthumously he was awarded the Legion of Merit, The Bronze Medal with Valor Device and The Purple Heart. I would say Bob was certainly one of the Best of The Best. He Valiantly strived to be the one who anyone could turn to for Strentgh & Courage. As I climbed up Cadilliac with my fellow team members, I couldn’t help but think of what a great man Bob was. I am indebted to him (along with so many others) for his service and his Ultimate Sacrifice. I am very Proud and Honored to carry his stone, his story and help keep his memory alive. His mother Mary Alice and I have joined an “Elite” organiztion that no one signs up to belong to. I’m Humbled that his Stone chose me to carry it. I’ve come to know that the stones that are placed in our hands are the ones we’re supposed to carry. As I research him and ask his mom for stories, I found out that he too was born in January of 1965, ( our actual birthday’s are 2 days apart). We were both born & raised as “County Kids” in Northern Maine. With each step up took I could visualize him growing up on Loring Air Force Base, picking potatoes, hunting, fishing, snow sledding and riding a toboggan down across the deep snow filled hills where we bothe grew up. Dear Lorna, This is the 2nd reply to you. The 1st one disappeared while I was typing you. I just wanted to say “thank you” again for carrying Bob’s stone. I know you know what its like. It is thanks to you and so many others our burdens are lifted, if only for a little while. I am grateful for the summit project, as well as the run for the fallen for keeping the memory of our kids alive. I reread your Dustin’s story, wanting to get to know him. Wished we lived closer, I’d like to invite you for coffee. Lorna, I’ve tried twice to thank you, and my message dissapears while I am writing it. Maybe you got them, I don’t know but I can’t find them. Please know I am grateful. M.
My name is Damon, and I am 16 years young. On October 20th, my English class went on a trip to Streaked Mountain. During the hike, I had the honor to hold Robert Horrigan’s stone. It was a great experience. The view was beautiful and although the hike was difficult, it made me realize how much harder it is for soldiers, like all the stuff they have to carry and all the work they have to do just to get in the military. It was very interesting to find out so much about someone I didn’t even know. I feel like I knew Bob after all the research and the hike up the mountain. The story about how he did what he believed in was truly touching. His bravery is unexplainable, and his will to fight for our country goes far beyond others. I thought it was funny how when him and his twin brother were younger, they’d always end up getting the same injury, just in slightly different ways. My favorite one was when Bob got a black eye and his grandmother said “Oh good, I’ll be able to tell them apart.” That made me laugh. But than his twin got a black eye too from falling off the couch which made me laugh even more, even though that probably hurt a lot. It just reminds me of when I was around 7 years old and when I’d always end up getting injured and my mom would end up having to get me a ice pack, or take me to the hospital. I’m glad you shared these small stories about Bob and his family as it allowed me to connect to him more and really get to know who he was. I’m honored to say that I carried Bob’s stone to the top of Streaked Mountain, because for once I’m doing all the carrying for him instead of him doing it for me. Hearing his story about how he carried others equipment because they were tired made me feel like I was him carrying his stuff up the mountain for him. Someday I want to build up the courage Bob did and share my courage with the world. Dear Damon, I must apologize for being so tardy in replying to your note. Your letter meant so much to me. You can imagine that a mother never can forget her child, but it is such a gift to me for others to learn about him. I get to introduce him to really neat people. You did for me what I cannot do, climbed a mountain. ( I am too old now.) But I envy you. You would have liked Bob and I know you guys would have hit it off. As I sit here on this cold November day in Maine, daydreaming of Thanksgiving and all I am thankful for, my mind wanders Army MSG Robert Horrigan and how thankful I am to have been part of his Summit Project story. I am a firm believer in the fact that things happen for a reason. My mother had the honor of carrying MSG Horrigan’s soldier stone in our city’s Veteran’s Day 4 Miler road race last year. I cheered her on and joined the crew when they took the stones to a local summit for a remembrance ceremony. I watched my mother form a bond with that soldier and little did we both realize how deep that bond would truly run. A few months later divine intervention brought my mother and MSG Horrigan’s family together when my mother helped sort out a scam that the family encountered when attempting to come to Maine to visit. My mother was able to meet some of his family and they presented her with a beautiful cross necklace which was a replica of the cross that this brave soldier was wearing the night he gave his life for our country. This year as my friend received the names of the soldiers that would be carried in the road race, she found that a single duplicate stone had been assigned. MSG Horrigan was coming back to Ellsworth and she offered ME the chance to carry him. As the days passed before the race I came to this page and read all of the testimonials, I researched this soldier and built my own bond with him. On race day I managed to get my mother to allow me to wear his cross for my race and I swear I could feel him there with me for those 4 miles. Typically I do races with my Mother but this one I did alone, and yet I knew I was NOT alone. Every step I took I thought of this soldier. I thought of his bravery for volunteering for that night raid – just days before he was set to return home to his family. I thought about his family receiving word that he had given his life for this country. I thought about his twin brother, his mother, everyone in his family. As I ran the final mile of the race, my feet hurt, my knees hurt, but none of that mattered one bit as I felt the weight of that soldier stone both weighing me down but also lifting me up. I held that stone high as I crossed the finish line with tears in my eyes and a lump in my throat. The minute I crossed that line all of the emotions came flooding over me. I found a rock and sat and cried as I hugged that stone for all its worth. I found it extremely hard to lay that stone down after the race. I feel this amazing bond that I truly will never forget. I returned the stone to the plush resting spot with the others but I hope that MSG Horrigan’s family knows that his story will NEVER be forgotten. He may be laid to rest, but I personally will spread his story of bravery and sacrifice until the day I am laid to rest. Thank you Kayla, thank you all. I don’t check this site often—though I am awed, overwhelmed, and so grateful when I do. But it still hurts a little. It’s wonderful that you carry his stone. It’s wonderful that you have taken the time to learn about him and been inspired by him. He was really neat. I miss him still. Mary, my dear friend Joelle (who organized the events in Ellsworth where my mother and I had the honor or carrying your son’s stone) had the privileged of meeting you at the event in Baxter this past weekend. She is full of stories and love of your family that I cannot wait to hear and I quite honestly and jealous that she was able to meet you! I cannot fathom the pain you feel for the loss of Robert but as I said in my reflection, he may have been laid to rest myself and the other TSP members will never let his story die. Maine Heros Are Never Forgotten! It was great to meet you when I had the honor and privalage to carry your son’s stone at the Baxter State Park hike in May. It was facinating to talk to someone who knew so much about Robert, and to learn new things about him. Our hike was met with perfect, clear weather. It was a great day to show our respect for our heroes. All the way up, my thoughts turned to Robert and the wonderful stories from his 20 years of service as “Pack Mule”. Our hike was long and difficult, but on that day, it really didn’t matter. It was about giving our heroes the respect and rememberance they deserve. At the summit of the Owl trail, we took our time to really explain, describe, and honor the stories that Maine’s fallen military left behind them. Words really can’t describe the emotion and the feeling of awe for those brave men who gave the ultimate sacrifice. … and of coarse, meeting your awesome dog Frankie. I can’t wait to carry Robert’s stone again at the Caddilac Mountain hike 2017! Eric did you get my reply? I’m afraid I lost out. I am so grateful to you for your willingness to go beyond your comfort zone. That climb could not have been easy. Speaking in front of others could not have been easy. Thank you again. I was so impressed with you Eric that you wanted to do this. Thank you. Climbing. mt is hard enough without adding more weight. Speaking in public is hard too. God bless you. I want to start off by expressing my deepest condolences for your loss, as no one should have to experience the pain you have had to endure. It is a true testament of your strength to share Roberts’s story so that his legacy may live on for years to come. When I decided to be a part of The Summit Project, I knew I would face the challenge of choosing which memorial stone to carry with me on my hike. Like most, I would have been honored to carry any of the stones available, but it wasn’t until I came across Robert that I felt a true connection. After reading his story and learning about who Robert was, the answer was simple, his stone would be the one to accompany me on my climb up Mt. Katahdin. Like Robert, I too am the second born of a set of twins. When reading about his childhood and closeness with his twin brother, I couldn’t help but think of my twin sister. Only twin siblings can understand the bond they share with each other – it is truly an amazing thing. I then discovered Robert’s love and desire to be in the outdoors which is something I also can relate to. Being an average student myself, I was always finding myself itching to get outside. My father being from “The County” had always encouraged me and my siblings to enjoy the outdoors. Many childhood memories consisted of fishing and boating on the lake and hiking in the woods. Over the past few weeks, I have read and learned much about Robert and his goodwill towards others, but above all I learned about his bravery and selfless devotion to his country. I cannot think of a better soldier deserving of all his awards and decorations. I was very honored and proud to carry a stone engraved with his name. As for the hike which took place on August 11, 2017, at the onset I remember gazing up at the rugose and rough-hewn mountain with a sense of awe. After climbing for some time, the sky-spearing ridges of the mountain that were once catacomb quiet became overwhelmingly loud. The wind consumed the many faces of the mountain. And the insidious mist quickly turned into heavy rains as it crossed the crown of the peak. It was at this moment that the biting cold had almost convinced me to give up. As my body lied along the trail hidden under some brush about a mile from the top, I thought of Robert and remembered all of the amiable words others had spoke about him. I remembered his bravery, dedication and desire to never quit. It was then the brumal cold felt sparse and bearable. As the storm subsided, I then went on to finish the climb to the summit in his memory. For the days that followed my climb, I found myself thinking of Robert. I was once again privileged to carry his Summit Project stone in the 2017 Husky Ruck Memorial 10k and obstacle course. It was a challenging course that paid tribute to another fallen hero of Maine. Although my legs tired from doing the Mt. Katahdin climb days before, Robert’s spirit gave me the push I needed to complete the race. He has given me a sense of confidence I didn’t quite have before. In life, I have found there are moments, like during the climb, when we feel like we cannot make it. We find ourselves looking for excuses to turn back or give up. Learning of Robert’s story has changed that for me. His level of loyalty, courage, and mental toughness are qualities I aspire to have someday. I know from this day forward that Robert will always be a part of my life and I will think of him often. It has been a privilege to take part in The Summit Project and I encourage others to do so as well – because in the end everyone should have a Robert in their life. To all of the family and friends of Army MSG Robert M. Horrigan, thank you for allowing me to share Robert’s impact on me as a way to keep his legacy alive and I want to end by giving my thanks to Robert for his service and sacrifice – you have done our country proud. Thank you for sharing Robert’s memorial stone with me. I felt truly honored to carry him up Old Speck and Eyebrow Loop on Saturday, September 30th, 2017 in Grafton Notch, Maine. It was a beautiful cool, crisp, partly cloudy autumn day with the leaves just beginning to turn color. I hiked with a friend who carried Army Sgt Jason Swiger’s memorial rock. Together, we felt the awe of carrying two soldiers who gave their lives in order to maintain freedom, justice, and respect – for the military, American Flag and United States. We stopped several places along the trail to look out over the stunning mountains. I shared all that I saw with Robert and I felt his presence and strength. At the top, we climbed the fire tower and placed his stone next to Jason’s memorial stone. They both had an amazing view of the Maine and New Hampshire mountains. I did not understand the extent of Robert’s expertise in the military until all of his accomplishments and medals were explained to me. Afterwards, I was wondering if I was worthy to carry him, at all. Then, I thought maybe I was the perfect person to carry him and honor him. I had chosen him because he was in the Army, from Limestone, a twin, older, and his stone was picked from beneath an apple tree. The photo of his mother, Mary Alice Horrigan, holding the stone drew me in. Some may say pretty superficial reasons to chose a soldier. I would disagree. I connected to Robert, perhaps the way his family connected with him, on a human personal level. I wasn’t drawn to him by all of his military accomplishments. Although, I became extremely impressed by his service record and his ability to be the ‘pack mule’ and the one who volunteered and led his team on mission after mission. I feel Robert’s presence with me and I will draw upon his fortitude, resilience, and endurance as I struggle with some major obstacles in my life. I know there is a reason The Summit Project entered my life at this time. Thank you very much for sharing Robert’s stone with me and allowing me the privilege to carry him and keep his memory alive. Thank you! We first met at the dinner table at NEOC for BSP ’17 the evening of the hike. We discussed the effect of PTSD on veterans, women and children. The PTSD Spirit Stone made its first appearance at that event. My friend and coworker’s family inspired that Stone, and I carried the Stories of USCG CPO William “Billy” Lappin and the Stone of Army Capt. Kevin Ouellette to the summit of The Owl. You asked me that night if I would carry Bob’s Stone in Acadia. Being a relative “newbie” to TSP, I had no idea what was being asked of me. I happily agreed, feeling proud that a Gold Star Mother saw something in me that would do justice to her son’s Story. I had no idea I would be carrying the Story of such a great man, a great soldier and a great American. I thought of you often throughout the summer. Upon agreeing to be a team leader for the ANP event, I asked for the honor to carry Army MSG Robert Horrigan and the PTSD Stones. My request was granted and I attempted to reach out to you, but we didn’t connect. I read the pages of letters on the TSP website, tissues in hand. I remain touched at how you bravely thank each individual with a personal comment. My research of Bob’s life brought me to his page on Fallen Heroes Memorial website. His Ranger brothers, comrades, sergeants, and men he served with all over the world write of his courage, his mentorship and the honor they feel having known him. They write of his sense of humor, professionalism and focus. One of the most moving testimonials is from Kurdistan who thanked Bob as a friend of the Iraqi people and a hero to the Kurds. Bob had an incredible impact on so many. Bob and I were born three years apart. I think I “knew” him and his brother John in high school; mischievous, self-assured and focused. The kind of guy my folks warned me about dating, but upon meeting him, made room for him at the table. Having the connection of our generation brings me a bit closer to understanding his motivation and ethics. And I believe we would have laughed together. I carried Bob’s Stone on the South Ridge Trail to the summit of Cadillac Mountain on October 14, 2017, part of the 17 members of Team Blackwood. The day was warm, but overcast, and the trail was dry. The gentle slope and quiet beauty led us to Eagles Crag where we took a break. We placed our Stones in front of low shrubs with bright red leaves and the green needles of junipers, with the background of the ocean, hills and peaking foliage. We enjoyed the beauty of an Autumn day in Maine, grateful for the sacrifices of our Heroes. Our photographer and her friend caught up with us there to document the rest of our journey to the summit. Bob would have been proud of Team Blackwood, because we were a close-knit unit. We were never out of sight from one another, held ourselves accountable, and gave help and encouragement when needed. We rigged a hiking pole to proudly display our American flag, and the Team took turns holding the flag and leading on the trail. The weather changed as we crossed the granite ledges, with 25 mph winds and a dense mist. The memory of the flag, held high by my Teammates is one I’ll never forget. Our Sharing Circle at the summit was deeply moving. Seven members of our Team were participating on their first hike. All spoke beautifully and passionately. As the Stories moved around the Circle, the Sun would break through, hide and then reappear. Bob had many friends at the Circle, including Joelle, Kayla and Alain. I spoke of your incredibly brave, selfless, Soldier of a Son. So close to coming home to his wife Denise, their daughter Courtney, his brothers John and Dan, sister Lisa and you. I spoke of the Ranger, Special Forces, Delta Force Soldier his Brothers honored second to none, and his arm’s length list of medals and awards. And of course I spoke of you, my friend. The love you have for your son, and how much he is missed. That night, I told my partner Bob that day was one of the best of my life. You, Mary Alice, were a big part of my day, as was the honor and privilege to carry the Stone and Story of your son, MSG Bob Horrigan. Thank you for sharing your story and time with me. Hi, my name is Caleb. I am a Boy Scout like Robert was. I did The Summit Project for Boy Scouts. My troop went to Black Cap Mountain. I carried Bob’s stone up along with the Honor Spirit Stone. I believe that Bob should be honored because he served in the military and helped our country survive. My name is Steve Prewitt, and two weeks ago I had the honor and privilege to carry your son, MSG Robert Horrigan’s very powerful story and his stone to the summit of Owl. This was my second hike with The Summit Project, and I would be remiss to say that this second hike was even more special than the first. I love everything about this project. I love the initiative of keeping the memories of Maine’s heroes alive with a living memorial. I love that the hikers sign up to learn about their assigned stone, and the responsibility of learning about the person that stone represents. There is a real emotional connection that begins to develop in the process of learning about these fallen heroes. I will tell you that I really felt humbled learning about Robert. Through my research online, and reading previous posts on his page, her on the Summit Project Website, there are no words to describe the kind of dedication, internal strength and drive that Robert must have possessed. I learned about him, identified with his age, his sense of pride while serving his nation, but also completely identified with his duty and leadership to the men he served with. There are few things in life that bring you as close as the relationships that are forged with one’s team. I can but imagine how close those ties are within the units that Robert was serving. I carried Robert’s stone to the summit of Owl in Baxter State Park, anxious to share his story with the team of hikers that accompanied be to the top. I watched in awe as each of those hikers took a turn providing stories about their assigned hero, and their personal experiences with the day and the research. I truly got choked up when it got to be my turn, mostly because I just wanted so bad to do Robert’s story some justice. I tried, and think that I succeeded. It was a very humbling and gratifying experience. I even got to experience my son’s journey as a hiker. I watched him share his story, and carry his stone. The hike and summit were amazing. But, the true summit, or pinnacle of the weekend, for me, was the 15 minutes that I got to meet and speak to you. It was a real honor to make your acquaintance, and although as brief as our meeting was, I can see where your son must have gotten his grit. You really seem to be a solid and straightforward person, such an inspiring figure. I want you to know that I look forward to another opportunity to speak with you, and really enjoyed the additional stories that you chose to share with me. My name is Steve Crowell, and I was honored to carry the stone and story of Arm MSG Robert M. Horrigan at TSP @ ANP on 29 September 2018. I tried, apparently unsuccessfully to post my letter a couple days ago, but I don’t see it here yet. If this ends up being a duplicate, please accept my apology. Please convey to your family my sincere sorrow for your loss. I was a “first time” hiker on Sept 29, 2018 at The Summit Project at Acadia National Park. I had the distinct honor of carrying the beautiful heart-shaped stone representing Robert’s sacrifice to the summit of Cadillac Mountain on a gorgeous sunny day. As our team ascended the trail we stopped several times to place the stones we were carrying respectfully on the ground, where we paid silent tribute to the heroes they represent. At the summit our circle ceremony celebrated the lives of our loyal and brave protectors. Friday evening, as we were unpacking the stones, the “date stone” was handed to me, and I was completely overcome by its significance. 7/4/76 9/11/01. Standing for every hero fallen from the beginning of the Revolutionary War to the terror of September Eleven. I pray that I honored Robert by carrying that stone, along with his, to the summit. His story led me to believe he would have done the same, or more. This has been an unforgettable experience for me, and I thank you for allowing me to honor your son.